Advocating for good education and supporting educational related activities have always been S.S.A.B’s flying banner since its establishment. This year, the company again stepped in as the major sponsor for the Interschool Champ of Champs athletic competition 2018, this would be the third time in three consecutive years the S.S.A.B. have been the major sponsor for this prominent athletic event in the country. “I believe that helping the students through sports events such as Champs of Champs will open up more opportunities for them to explore,” says the C.E.O. of S.S.A.B., Tofilau Fiti Leung Wai. Champ of Champs is the biggest athletic event for colleges from Savaii and Upolu every year and was successfully executed because of the collaborative efforts by the Champ of champs committee and S.S.A.B. as the major sponsor. 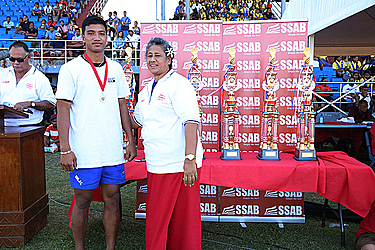 S.S.A.B’s involvement in Champ of champs enabled the officials to reward divisional winners for their commitment and hardwork during their track and field events. S.S.A.B. aims to motivate students to bring out their talents and encourage them to participate in physical activities and become socially involved. Tofilau also emphasized that this is also an opportunity that students should utilize to befriend with students from other schools and stand up against violence involving schools particularly in the secondary level. She declared that S.S.A.B. will also be the major sponsor for the Champ of Champs 2019.